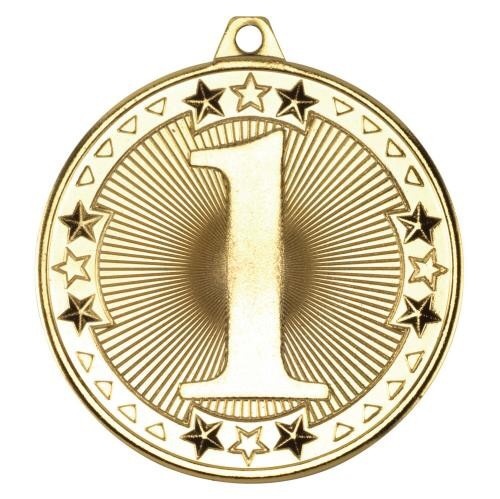 Today is the first Tax Free day in Ireland (well, Dublin really). It’s an initiative by a group of pubs who have come together to raise the awareness amongst pub goers the effects that excise duties and VAT has on the price of alcohol. The tactic is modelled on a similar one in the UK, now in its fourth year and coincidentally took place yesterday. This is the latest initiative in the campaign to get the Irish Government reduce the excise duties. 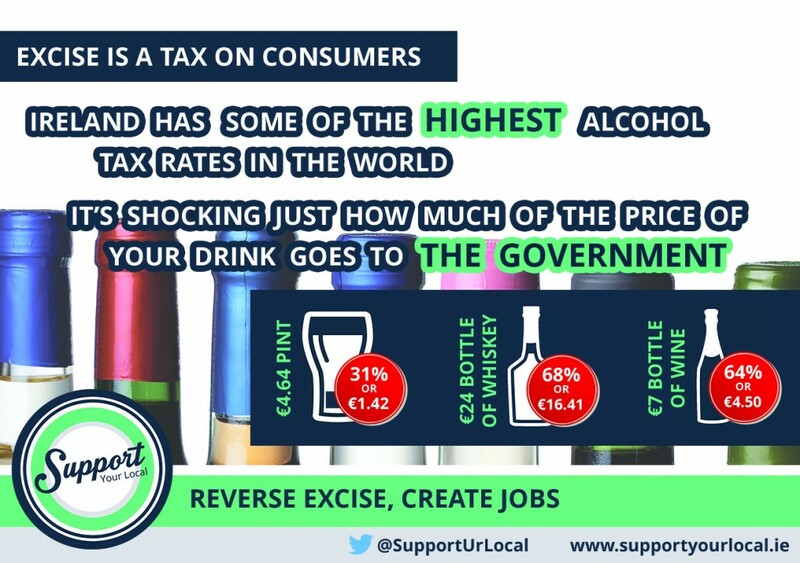 Irish consumers pay the second highest tax rates on alcohol in the EU and we’re the most expensive country in the Eurozone for buying booze, we’re approximately 70% above the Eurozone average. The Support Your Local campaign has bought many different parts of the industry together to put a more unified voice to Government but this step by the publicans alone has the ability to put the issue front and centre of the consumers themselves. Tax is certainly a complex issue and one that many admit to neither understanding nor having any real interest in. But when it comes to what we buy, we should really pay attention. Excise and VAT hit us where it hurts. We often hear about the regressive nature of them and they are, hitting lower income earners disproportionately. They’re a direct tax on the consumer because more likely than not they’re passed on in full to consumers in the form of higher prices. In fact our inflation level has remained largely constant but the proportion of alcohol’s contribution to the overall inflation level has steadily increased. With less than three weeks to Budget Day, the campaign is gaining momentum. 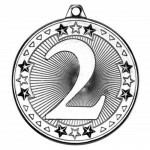 Will it have the same result as the campaign to retain the 9% VAT rate for the tourism sector? It’s strange for tourists to see the likes of Jameson whisky more expensive in Ireland than at home. However, I would hope that Government pays close attention the effects that excise coupled with VAT is having on the domestic economy. Halting the increase in excise duties would help, just that little bit. We simply have to get away from the Economics 101 practice of budgeting. It should not be a case of when in doubt, look to the “usual suspects” to raise cash. We’ve a burgeoning indigenous alcohol industry and taxing their product out of the market will help no one in the long term. The Scottish Independence Referendum comes to a head this week and by Friday, we’ll know the result. Either way, Scotland will be getting more power from Westminster (albeit not as much with a “No” vote). I’ve been heavily involved in referenda over the years and know that the most ethereal things can capture the attention and swing votes. There have been a few people out there in the blogosphere commenting on the referendum in the context of beer but are there beers out there looking to speak out themselves on the vote? Famous (or infamous depending on your view) for speaking out on topical issues through their beers, BrewDog has chosen to remain silent on the referendum. They’ve even refrained from making any public statements on this vote. While this may be surprising for some and disappointing for others, it’s completely understandable. For a company in Scotland with significant presence across Britain (both in terms of staff and locations), it’s an extremely sensitive issue for them. Although a few people out there are joking that in the event of a “Yes” vote, BrewDog could be back at the Great British Beer Festival but on the foreign beer bar with kegs! So it appears to have fallen to Ireland’s very own Eight Degrees to take the plunge and nail the Scottish colours to their latest limited edition brew. Alba Abú makes no secret what result is desired on Friday. Eight Degrees have been embarking on a single-hop series of late and they use plenty of Chinook in this Scotch ale, which also contains heather and pine. Scotch ales can be an acquired taste as some people are put off by darker, sweeter tasting beers but this beer proved to be an extremely popular choice at the Irish Craft Beer and Cider Festival. Earlier this week I was in touch with Scott Baigent, the kiwi-half of Eight Degrees. Scott kindly took timeout from his busy schedule to discuss Alba Abú. 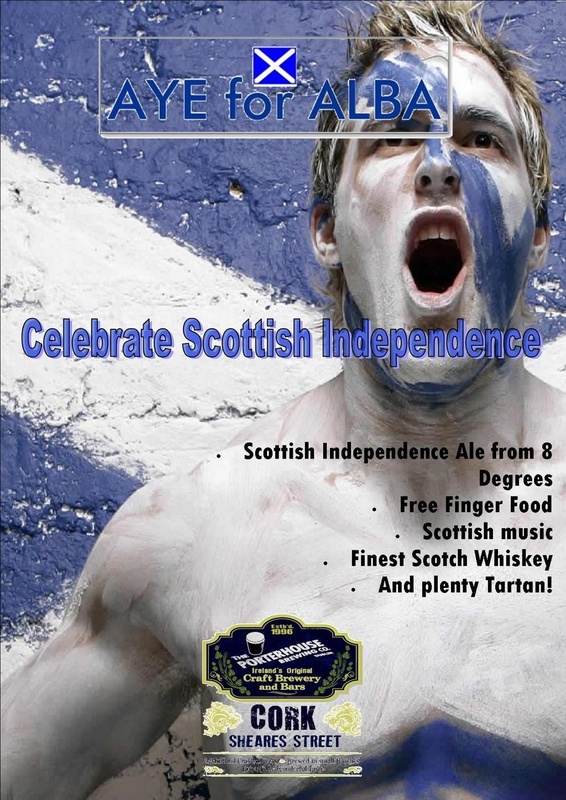 Being Antipodeans living in Ireland did you come up with the name as a cheeky nod to Scottish Independence? Our intention behind Alba Abú was not to make a statement as a couple of Antipodeans, but as an Irish business. We have been following the build up to the independence vote over the last year and felt that it had massive ramifications for Ireland both economically and politically. We were disappointed at the lack of public discussion on the vote, and in particular, the lack of solidarity from the political elite. From Scotland, I can only imagine that from the silence across the Irish Sea, they must think that Ireland is largely indifferent to the vote. We decided that as an Irish business we wanted to get off the fence and show some of that solidarity to the Scottish independence movement. In terms of the beer itself, how did it come about? The Alba Abú recipe was developed in collaboration with a local company to us, Ballyhoura Mushrooms. Ballyhoura Mushrooms specialise in growing fantastic gourmet mushrooms and also in wild foraging ingredients for great restaurants around the country. We played around with ideas for various locally sourced wild foraged ingredients, and felt that heather and Scots pine needles would provide a great floral and pine aroma to a beer and also a synergy with the story. 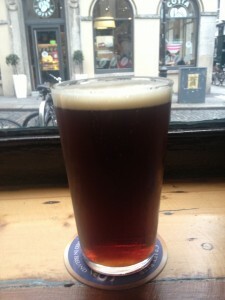 The beer recipe itself was loosely based on a brown Scotch Ale and then enhanced further by substituting traditional Cara/Crystal additions with wonderful Weyermanns Cara Aroma malt. For hop selection, we went for multiple Chinook additions – primarily to form parallels between the pine aroma characteristics of the Chinook hop and the pine needle. 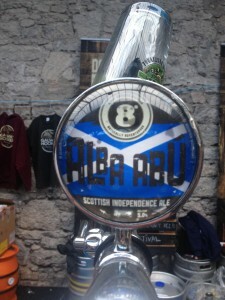 We were anxious that Alba Abú would be a great beer and sell itself, irrespective of the political message behind it. Are you surprised with the name generating a lot of media interest? Our intentions with the beer name was to find a balance between making a bit of a public statement while not overegging it. Hopefully we struck that balance! What do you say to people out there on social media saying beer has no place in politics? We were interested in the sociological aspects of this campaign: Beer is a well known lubricant for political discussion – what would happen if the beer prompted the topic for political discussion? We are always pleased to see craft beer consumers highly engaged with us on social media – and to be honest we weren’t too sure what the reaction was going to be. 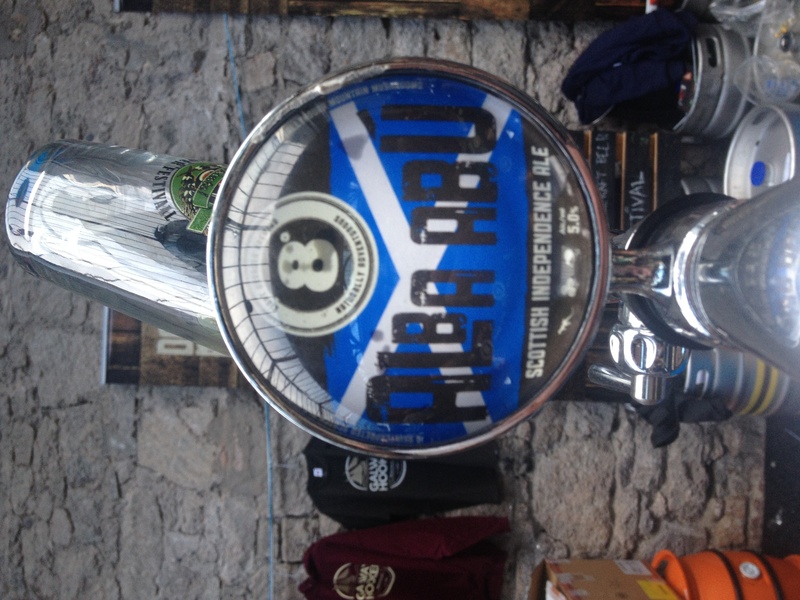 We felt strongly enough about what we were trying say with Alba Abú, that we were willing to take any criticism on the appropriateness of a brewery making such statements on the chin. Last year, the award-winning Amber Ella made its debut at the Irish Craft Beer & Cider Festival, will Alba Abu be merely a once-off or do you see it becoming a regular release or autumn seasonal? If the vote goes the other way, will you be considering a name change for the beer? Alba Abú was conceived and developed solely for the independence vote. We such a great pipeline of limited edition and seasonal releases coming through in the next couple of months that we don’t have the capacity to do a repeat brew of it. Wasn’t it the first beer of yours to sell out at the festival? Any comments from patrons on the name? Yes, it sold out mid way through Sunday, and was probably our greatest seller at the festival. Based on people repeatedly coming back for it, this appeared to be because it was a great tasting beer rather than necessarily the story. 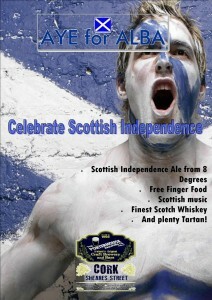 We had a couple of patriotic Scottish friends resident in Ireland helping out behind the bar on Friday and Saturday. The beer gave them a great forum to talk with people and explain the importance of the vote for them personally, Scotland and implications for Ireland. As only people resident in Scotland are able to vote, it gave them a public way of expressing their strongly held views, although they won’t have the opportunity to do so at the voting booth. 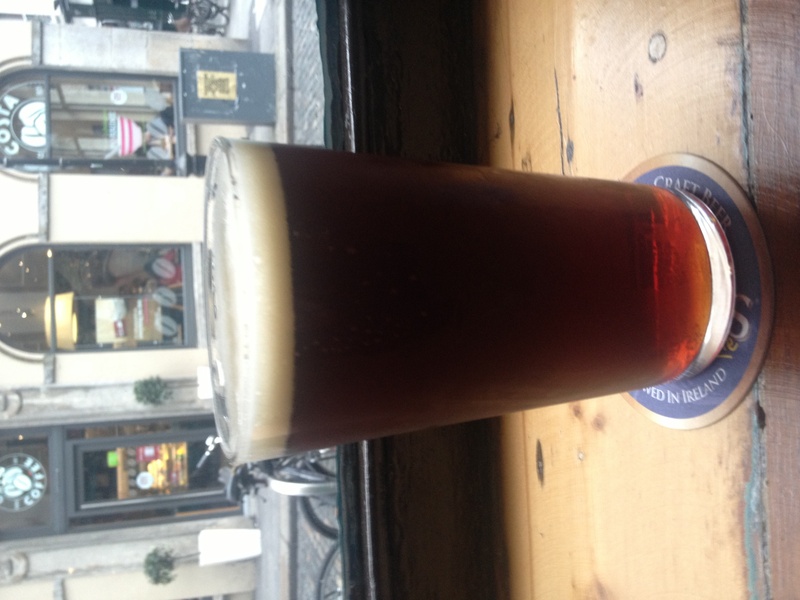 Last Sunday, I had the chance to enjoy a pint Alba Abú in The Norseman in Temple Bar. It’s one to look out for if you haven’t tried it or better yet it’s one to have over the next few days to either celebrate or think what might have been. Ahead of the Irish Craft Beer & Cider Festival this year, I circulated my top tips to enjoying a beer festival. 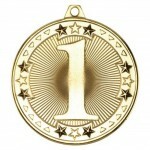 The organisers ran a competition to win tickets for the festival where people had to choose their top tip from the list. 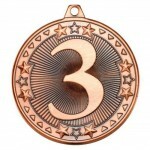 The following are the top 3 tips for enjoying a beer festival as chosen by you. Get to know their story, their inspiration and where the beer comes from, it can give you an added appreciation of the beer in your glass. Who says that wine can be the only one with terroir! Confused about beer, don’t know what a IPA is or what hops do? Ask. Beer festivals aren’t just for beer nerds like me (don’t worry there’ll be plenty of us at the festival) and don’t feel intimidated by other people asking fairly intense questions. Brewers are more than happy to talk to you because they want to win you over and gain new customers. Feel free to tell them what styles you like and let them suggest beers to try. You might like them and when the festival returns, you might be the one asking those tricky questions. Festivals are a time to discover something new as well as reacquainting yourself with old friends. It’s not in the breweries interest if the only beer you try from them is not for you (they may have plenty of other that do) so don’t be afraid to ask before you buy. It’s also a great way of getting to learn about different styles and tick off a number of the beers at a festival. 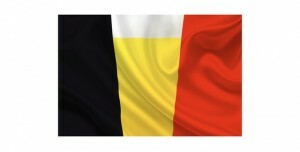 This is my first time participating in the session and what could be a more appropriate topic than “My first Belgian”. I became conscious of the craft beer movement in the mid-nineties during what was to become the first of ten Christmases spent in Vermont. Unable to drink due to the unnecessarily restrictive drinking age of 21, I had to make do listening to conversations about beer by enthusiastic drinkers. Whilst some of the Von Trappes were living close by, it wasn’t Austrian beers that seemed to be lusted over but Belgian ones. Indeed, this trend continues today when US breweries are so influenced by different styles of beer produced by a country 28 times smaller. I can’t recall for definite when I first tried a beer from Belgium. The older brother at times was gifted beers chosen more for their alcoholic strength than style or origin. At times he’d share some of these when I was under-age but that being said he also gave me Buckfast at one time too. It is possible that an early introduction was via Leffe and Stella Artois would’ve been a likely candidate as well. Unfortunately, I never did get to go to Belgo while it was open in Dublin. This year marks the centenary of the outbreak of World War One and it is fitting that my first Belgian beer is coincidentally linked to a trip to see the battlefields back in 1999. It was the Easter weekend during my Leaving Cert year and I spent it in Brussels. Dinner with my parents on Good Friday required the observation of no meat (on my mother’s orders) so it consisted simply of a plain-enough pizza. Back in the hotel with the parentals retired to their room, I visited the bar. The bar of the Gresham Belson Hotel was non-descript, functional and modernist. The counter was small with space for a solitary barman behind. Wondering what to drink, the barman was quickly on hand to make some suggestions. This is a feature of Belgian bars. Their suggestions on the other hand may not be always welcome (a friend is just back from Antwerp where a barman tried not to serve her Rochfort 10 because it might be too strong for her). However, suggestions offered may lead visitors discover some rare treasures. It was one such suggestion in Delirium, back when it was just the one bar, which led me to discover Saison Dupont almost ten years ago now. So what did the barman offer me on this occasion? Well, given that Easter is a time for reverence and observance, he felt it was appropriate for me to try a beer produced by monks. 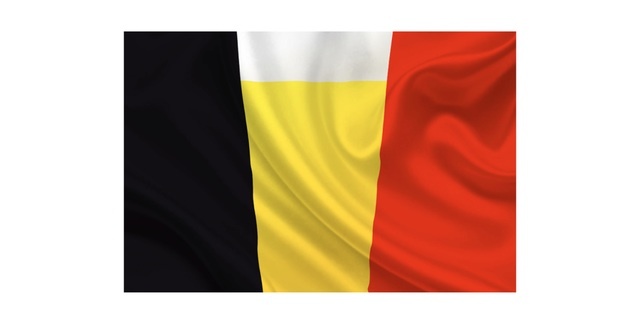 My first real Belgian beer experience was a bottle of Chimay Rouge. The barman was Flemish so addressed it as Chimay Dubbel. I had great fun the next morning asking at the front desk how to get to Yprès, only for the reply to be a mini-lesson on how to pronounce Ieper (from recollection it’s like eeeee – p – rrrrr). The barman told me the importance of decanting it into a glass, the right glass of course. This glass was a chalice. It was so different to Dublin where people were still getting excited over consuming Miller from bottles as the height of early Celtic Tiger sophistication. The beer was different to any dark beer I had tried before. The sweetness and pleasant carbonation grabbed hold of me. Instantly you could get a sense of localism in their beer and cuisine. I had a waffle or two and come chocolate of course earlier that day. Was this beer a game change for me? Well, it would be over-stating it if I said it was because of previous experience watching people around me trying some American craft beers, trying some that would be purchased on my behalf and some limited special beers available in Ireland in the late ‘90’s (it wouldn’t be until that autumn that I would venture into the Porterhouse in Temple Bar). However, I still remember it. Clearly. This was before I was into photographing unusual beers or ticking them off a list. It was a beer that I would go on to having a fair few of when I could get my hands on them in Dublin. There were times when I could be found consuming them in the Buttery Bar in Trinity. It wasn’t quite the same experience as back in the Belson but enjoyable none-the-less. I would get a bottle or two from the Dunnes Stores on Stephen’s Green and sneak them into the bar. I couldn’t get away with using a glass. It clearly looked completely different to any beer on sale and there was the fear of attracting the attention of concerned patrons or worse, the bar staff, that I got a “ropey” Guinness. I had to settle for the next best thing a Styrofoam cup but whilst doing little to the enjoyment of the beer, it did have one useful advantage. The beer’s tan head gave the impression for any inquisitive eyes that I was merely having one of the god-awful cappuccinos from the machine in the canteen next door. I then must admit that went on to ignore this beer over the years as different and more exotic beers became available. Chimay Grande Resérve being one of them. I recall the popularity of Duvel in the early noughties and becoming almost the international standard-bearer for Belgian beers. However, for me Duvel is sadly not as good as it once was. 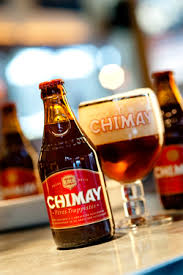 I rekindled my interest in Chimay Rouge when I moved to Brussels in 2005, which came as part of a wider exploration of Belgian beers once the day’s work finished. Tripels are easy to get people interested in them and people overlook dubbels due to factors such as colour and lower alcohol content. I like using both in beer tastings because it can open people’s eyes to two styles, and the dubbel I tend to use over others is what has become my longstanding companion, Chimay Rouge. I even served it during the main course during last year’s Christmas dinner. It has become a mainstay of my drinks list for Easter and Christmas and my wife has even managed to source a few bottles for when I spend Christmas over in Nashville.